The Dingoo A320 is a chinese manufactured PMP by Shenzen Dingoo Digital. 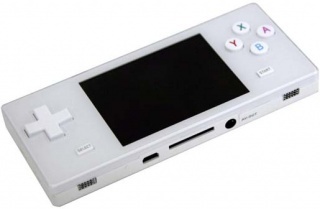 Out of the box, the handheld plays numerous emulators (NES, SNES, Mega-Drive, GBA, Neo Geo, CPS1, CPS2). The performance of some of the emulators is questionable. Also included are the standard set of PMP features. These specs refer to the components of the earlier editions of the Dingoo A320, though minor changes have been made to the hardware over time. The A330 is essentially an A320 with 64MB of RAM, a more ergonomic shell with wrist strap loop, more appropriately placed shoulder buttons, a higher quality LCD screen, and the ability to be used with the "F-16" wireless controller (sold separately) while in tv-out mode. The A330's LCD has a clearer, more colorful image quality over the A320's, and is somewhat better with viewing angles.